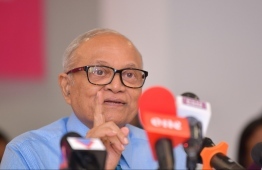 Former President Maumoon Abdul Gayoom applied to the Election’s Commission (EC) to register new political party, Maldives Reform Movement (MRM), on Sunday. Maumoon laid the foundations of MRM after recognising the difficulty in gaining the ownership of PPM through the courts. MRM was requested to be established in the name of Ibrahim Hassan who is currently serving as the Minister of Higher Education. President Yameen Abdul Gayoom, who served as PPM’s adviser, was unanimously elected as the leader during party’s Extraordinary Congress on September 2018. The Supreme Court approved Yameen’s appointment as the leader of PPM while the Chief Justice declared that the Civil Court did not have the jurisdiction to hand over the party leadership to Maumoon. Maumoon, however, still insists that he was removed from the leadership of the party against the party regulations. Speaking at the press conference held to announce the formation of MRM, Maumoon revealed that he does not want to abandon hope in the face of injustice. He went on to say that serving the nation does not require you to be a certain age as he wants to be involved in the political field in order for the reformation of Maldivian law. MRM is the third political party established by Asia’s longest-serving president. He established Dhivehi Rayyithunge Party (DRP) on 2005 after giving his consent to establish political parties in the Maldives. His disputes with the party leader, Ahmed Thasmeen Ali, led to the establishment of PPM in October 2011. Nonetheless, Maumoon was forced to leave PPM over the dispute in the leadership with his estranged half-brother and former president Yameen Abdul Gayoom.